Russia's state media is heavily dominated by US Special Counsel Robert Mueller's probe, with news channels making an issue out of the amount of money spent on it and gloating at its findings. A summary of Mr Mueller's long-awaited investigation released on Sunday found that the Trump campaign had not conspired with Russia. Commenting on the Mueller report on Monday, Kremlin spokesman Dmitry Peskov recalled the words attributed to Confucius, saying "it's hard to find a black cat in a dark room, especially if it's not there". "Much ado about nothing," said state-controlled Channel One TV, pointing out that the probe "lasted not a month and not a year and cost US taxpayers millions of dollars". Pro-Kremlin Ren TV said it was "as if icy water had been thrown on Democrats who ordered the investigation". It wondered how the Democrats would be able to "look into the eyes of ordinary Americans" after 25 million dollars of taxpayers' money "turned into a dry four-page report". "They were searching really hard, but found nothing," said state Rossiya 1 TV, adding that the taxpayers' money "was spent for the mountain to bring forth a mouse". But it pointed out that President Trump's opponents were still keen to prosecute either him or those who found themselves "under Mueller's surveillance". Gazprom Media-owned NTV said: "As of now, the main outcome of Mueller's work is reminiscent of a regular mantra from Mr Trump's Twitter feed: 'there was no collusion, the president is not guilty'". 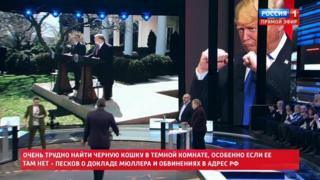 Popular Channel One show "Time Will Tell" showed a clip, which it jokingly presented as "exclusive footage", with people dancing in Indian clothes with Trump's smiling face superimposed on one of them to illustrate the US president's emotions about the outcome of the Mueller probe. Pundit Andrei Sushentsov said in a comment to heavyweight daily Nezavisimaya Gazeta: "Rational people should ask themselves a question: if during the two years of the probe no facts were found to accuse the president of betraying national interests and colluding with other states, wasn't this two-year campaign just ordinary hysterics on the part of the president's opponents?" State daily Rossiyskaya Gazeta noted in an article headlined "Mueller and emptiness" that "the information bomb on the so-called Russian trace in Trump's election campaign has not exploded and promised sensations have not happened". "Mueller, who has become a household name in the US, has put not a point but an ellipsis," the paper added, "making the country wait for news about his report more anxiously that if it was a forecast about the strength of a new storm. The show must go on." That sentiment was echoed by Ren TV. "No matter what, it is clear: the show will go on. According to experts, the failure of Mueller's probe will give Trump all chances to successfully run for a second presidential term," it said.